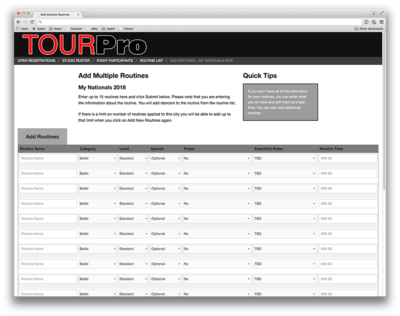 TourPro is the most powerful and easy to use dance convention and competition software on the market. It was designed and refined over the last 10 years to provide you a flexible registration platform that your customers and employees will love to use. A fast customer portal allows your studios to register quickly and easily and with over +140 reports you get to see how your events grow in real time! 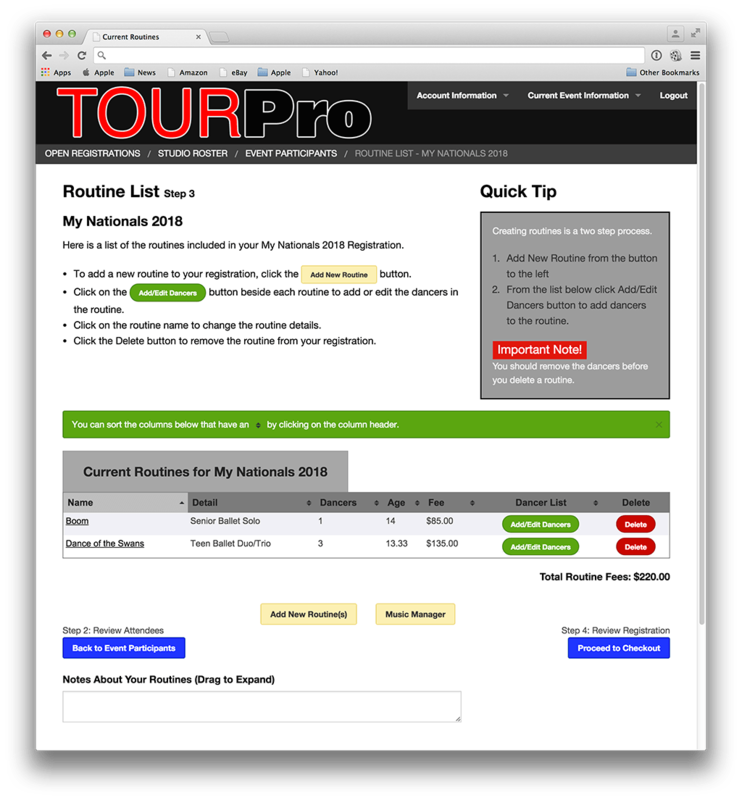 Build your competition order in a few clicks, TourPro will balance out your competition in categories you define and work out the scheduling conflicts automatically. You won’t even have time for a coffee. Our goal has always been to make the best platform possible that saves and even makes you money. With TourPro 3 we have done just that. Faster access to your data, more advanced reporting and no complex server setups required. On top of that there are no per routine or attendee charges. There are no add-ons, up-charges or hidden fees. Just one flat rate that includes your software, website, support and MORE! Schedule a demo by clicking the button below and find out why our customers LOVE using TourPro. For the past two years, we used another well known registration system. While using this system, we found ourselves working around the clock to keep up with the demand of changes and organization our event requires. 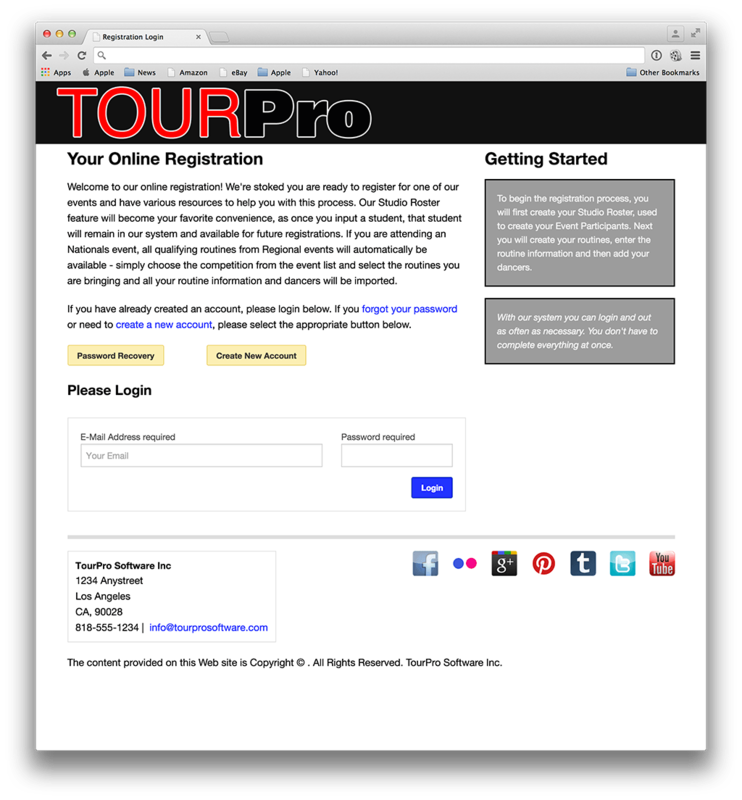 Within the first event of using TourPro, my business partner and myself were able to step away from the competition portion of the event for the first time. It seemed as if the event were running itself, and it did so successfully. 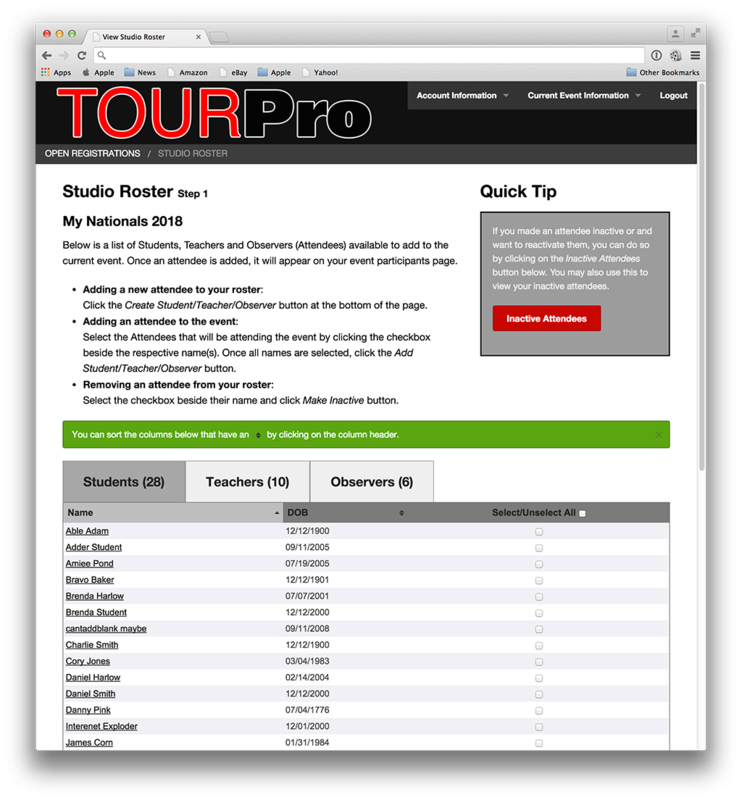 TourPro has made our product more streamlined and efficient, allowing us to focus on other aspects of our company. 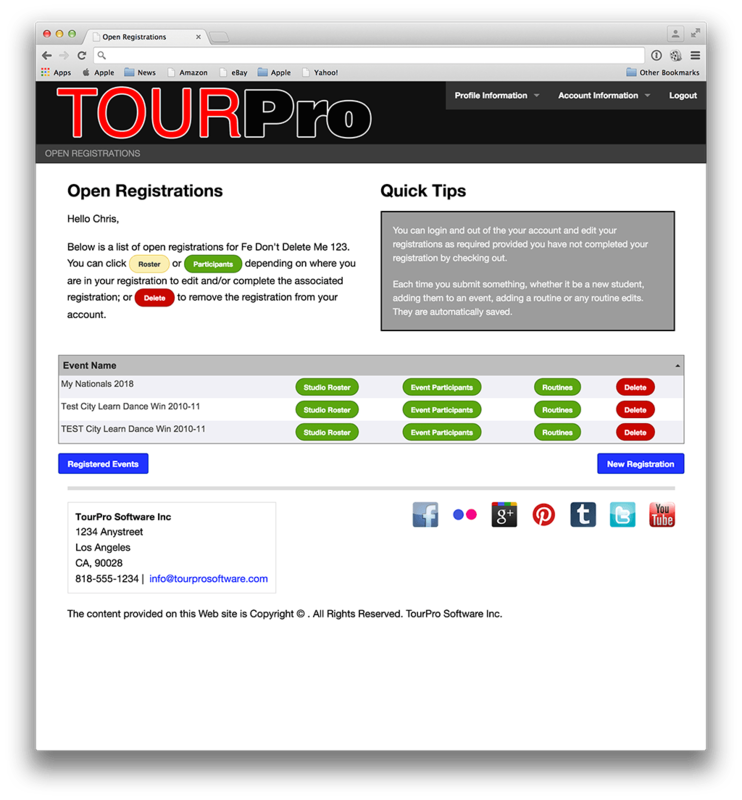 TourPro starts with a full featured app on your computer not a half featured web app. 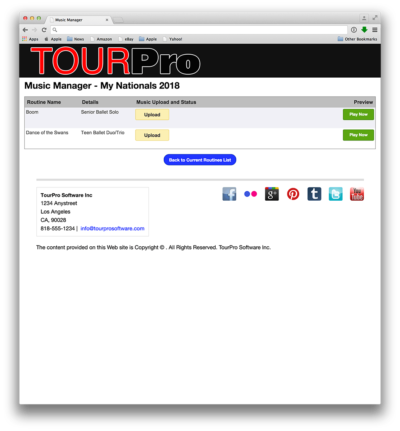 You get all the benefits of of your Mac or PC and complete control of your dance convention and competition right at the tip of your fingers no matter where you are. Every TourPro installation synchronizes with your own private website and own private database. 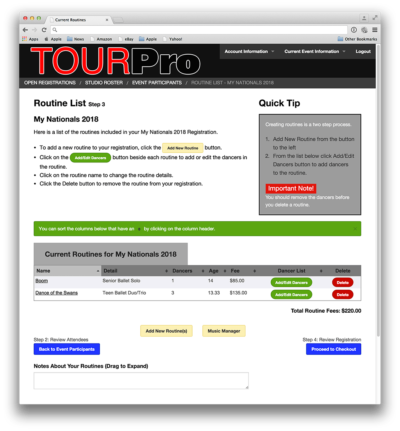 One click and you have all the registrations at your finger tips. 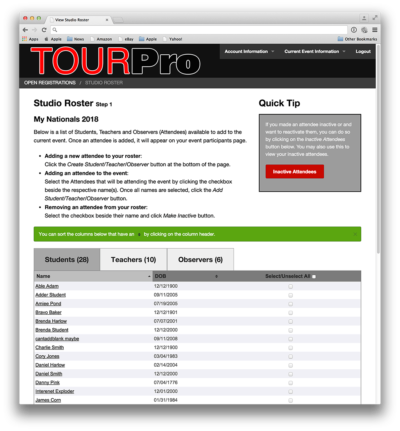 Setup TourPro onsite and have your judges input their scores notes and critiques in a seamless easy to use process. Over 100+ Reports are just a few click away. Instantly print or publish your competition scores with a few clicks. Clients can login to their private portal and access scores, notes and critiques. Automatic and Manual competition order creation. Quickly find any dancer conflicts. Build it how you want. Dynamic Reporting – Get Category overalls anyway you want in a single click. Fast and Easy Client Online Registration from anywhere computer, tablet or mobile phone. Accept Credit Cards online, and multiple payment management. The client portal is the first experience your potential clients will have when registering with you. It is imperative that they have a fast and simple experience to leave them excited about their event. 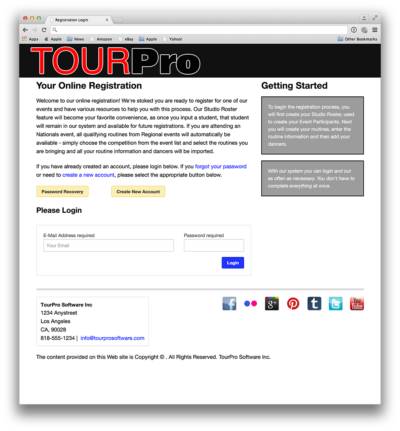 The TourPro online experience gives you your own private portal themed to match your website. Your data is not shared with other companies and private only to you. Once registrations start coming in you can watch them as they go through the registration process.